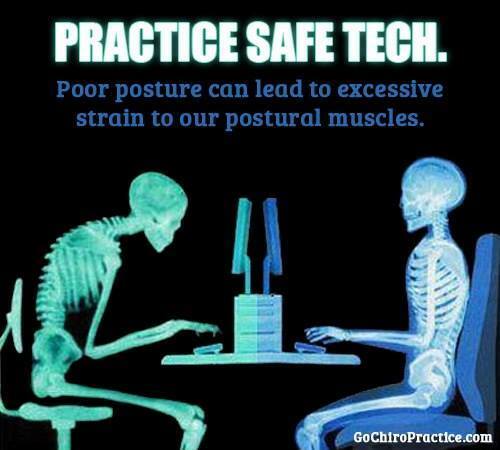 Practice Safe Tech Neck. 10 Tips to better Posture. – Keeps bones and joints in proper alignment to encourage efficient use of muscles. – Helps reduce abnormal wear and tear on joint surfaces. – Decreases the stress on the spinal ligaments. – Prevents abnormal spinal positions. – Prevents injury including strains, sprains, and overuse injuries. – Contributes to a good appearance. 1. Keep your pelvis neutral with your buttocks against the back of your chair. 2. Keep your ears, shoulders, and hips aligned. 4. Keep your hips and knees at 90 degrees. 5. Evenly distribute your weight over both hips (avoid leaning to one side). 6. Keep both feet flat on the ground (use foot stool if necessary). 7. Keep your forearms parallel with the floor, resting on your desk. 8. Place your computer monitor 18-24 inches from your face with the top 1/3 of monitor at eye level. 9. Regularly check that your head is not protruding forward. 10. Take periodic breaks & Stretch out. If you’re like many people, you spent countless hours seated at your desk and you may be suffering with aches and pains due to poor posture. Bad sitting habits, such as slouching or crossing your legs, can have a detrimental impact on the health of your spine. Fortunately, these bad habits can be corrected by following the tips outlines above. Simple changes to your workspace and your sitting posture can go a long way to improving the health of your spine. Newer PostCan Chiropractic Help You Find Allergy Relief?